What Makes Our E-Patterns The Best? When it comes to selling e-products everyone claims their products are the best. It's hard to know what's true and what isn't. If I were to tell you that our e-patterns really are the best you'd probably just shake your head and say, "ya, ya, ya." Well, the truth is they really are the best!" So, I thought I'd do something a little different. In order to make you a believer I thought I'd actually show you, "What makes Linda Walsh Originals Doll E-Patterns So Wonderful?" In order to answer that I'm going to show you exactly what all our e-patterns contain with some illustrations and then explain to you why our e-patterns are so great for any skill level. We have e-patterns for beginners, intermediate, and advanced skills. And, many of our e-patterns can be made by children with adult supervision. Once you see what we have to offer you can decide for yourselves whether or not ours are the best. Our doll e-patterns and craft e-patterns were designed to make it easy to follow sewing the doll or craft from beginning to end whether you are a beginner crafter and/or sewer or an experienced crafter and/or seamstress. Everything and anything you need to know are all contained within the e-pattern. And, depending on your skill level you can utilize just the instructions sheets, just the diagrams pages, or just the pattern pieces themselves to make the doll or craft. Personally, I don't like reading written instructions as much I like following pictures. But, most of all, I like putting things together just by using the pattern pieces. Kind of like a jig-saw puzzle. But, that's me. So, I thought I'd include something for everyone - those who like written instructions, those who like pictures or diagrams, and those who just want the pattern pieces. The front cover includes a digital picture of the doll, the Pattern #, doll size, doll’s name, and doll description. The back cover lists all of the supplies needed to make the doll, including where each of the supplies is used within the pattern (listed in the parenthesis). It also includes our business information, copyrights, and legal information concerning the use of our pattern. The pattern instructions and diagrams show in detail the sewing instructions, additional pieces to be cut, instructions for putting the doll together from start to finish, and diagrams to follow along. The pattern piece sheets are all full size page sheets. All of the pattern pieces are named and indicate the number of pieces to cut. The edges of all the pattern pieces are labeled as to edge placement and what sewing is to be done with that edge. If the edge is to be sewn to another pattern piece then the edge contains the name of that specific pattern piece. The fold lines, sewing lines, and cutting lines are all indicated as well. Our pattern piece sheets are all single sided full size page sheets and none of the pieces overlap one another or need to be reduced or enlarged. Whether you are a beginner, intermediate, or advanced crafter and/or sewer you should be able to easily follow our e-pattern directions for making the doll. If you like to sew using written instructions then just follow the sewing instruction sheets from start to finish. If you like to sew using pictures or diagrams just follow the diagrams from the first diagram straight thru to the last diagram. If you like a challenge and like to just put the doll together from the pattern pieces you can do that as well. Our e-patterns can be folded so they fit nicely in a 6" x 9" plastic sleeve. 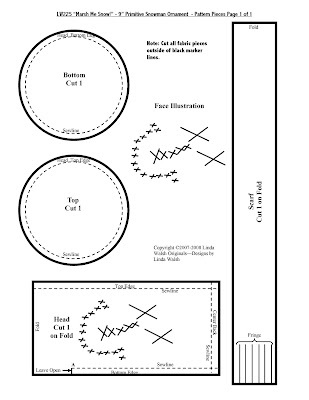 The first page of the .PDF e-pattern file is shown like the picture above and the front cover and back cover are turned sideways to make the e-pattern foldable to 6"x 9" size - just like a print pattern. 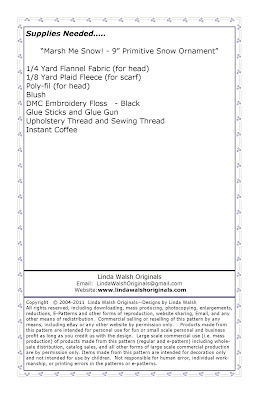 If you'd like to see one of our e-patterns and download it just CLICK HERE for the Free E-Patterns, E-Printables and E-Books page of my Linda's Blog. Just click on the category you want and then click on the freebie you want. Then just click on the link in the post to download it. You'll be brought to my Google Drive where you can view it or download it to your computer. Once my e-pattern is downloaded to your computer you can save it and print it. You can also save my e-pattern to your Google Drive. So now, hopefully, you have a good idea as to what our e-patterns contain and what makes them so wonderful. Now, I have a question for you. Why not try one of our e-patterns yourself?